Everyone knows that when the Maccabees wrested the Temple back from its Greek occupiers, they straightaway lit the menorah—symbol of light and consciousness. This golden candelabrum placed by the southern wall of the inner chamber just outside the Temple’s Holy of Holies is rich in mystical significance. 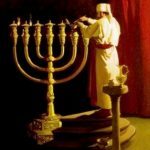 It is no wonder that of all the Tabernacle’s components, only the menorah (through our chanukkiyot) maintains an active presence in Jewish life. Eight days of every year it becomes our focus of dedicated attention. At Sinai, a searing revelation of presence engraved the souls of an entire nation with the truth-of-the-universe compressed into a single burst of light. The bare bones summary of that communication was scribed by Moses and constitutes the Written Torah. Its words are fixed and final. The menorah symbolizes the Oral Torah—the light that we shine back to HaShem. Behind every byte of Oral Torah is a smidgen of ruach hakodesh (Divine inspiration). The Talmud declares, “HaShem’s seal is truth.” Whenever a person contacts truth they contact Presence along with a whisper of ruach hakodesh. R. Tsadok asserts that every person, even the ignoramuses among us, can access enough ruach hakodesh to know what HaShem wants from us in any given moment. The Torah’s instruction about how to create the menorah conveys, through its details, precious secrets about how to cultivate this inspired state called ruach hakodesh. Consequently, on Chanukka (our festival of lights), we not only meditate on the flames, but also on the menorah itself (the original one) that is represented (albeit imperfectly) by our chanukkiyot. Forged from a single nugget of pure gold. The entire complex structure of the menorah, with its intricate details and six branches must be fashioned from a single block of gold. Every one of its branches, cups, and design elements must be pressed out from the original nugget while maintaining continuous (unsevered) connection with it. Of beaten work with no soldering. The menorah’s branches must not be made as individual units, that are, afterwards, soldered together. A single chunk of gold gets pounded against a mold and extraneous portions are pared away. The golden nugget is our own pure soul that contains the potentials we must (and will) actualize in the course of our days. Its wills, talents, and sensitivities are the resources HaShem has placed at our disposal. The mold that shapes us is the configuration of our life circumstances—the ordeals we encounter, the tests we must pass, the problems we must solve as well as the era, nation, and class we’re born into. The hammer that pounds us is our drive to survive the challenges of life, to draw on our resources and thrive despite life’s difficulties. The Midrash informs us that: “Every blade of grass has an angel that strikes it and urges it to grow.” Likewise does a human being, whose equivalent angel (implies Rambam) is simply their survival instinct. And finally the No Soldering rule also applies to our soul work. Whatever it is that we are to become, it must be pulled from the inside out. We cannot grab a branch from the guy next door and solder it on to our lamp’s central shaft. There’s no escaping authenticity when it comes to unpacking the portion of Torah that we are designed to share with the world. Unlike prophesy (which comes straight from above), ruach hakodesh comes from deep inside—from what Kabbala calls “breath of the bones”—a layer of self (similar to DNA) that directs our individuality and absorbs the effects of our chosen lifestyle. Access to ruach hakodesh grows in proportion to our individuation which, in turn, reflects our trueness of self. 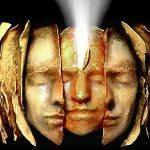 A soul enters the world as a pure gold nugget and leaves as a fully-formed, intricately designed, seven-branched menorah that radiates a truth about G-d that’s absolutely unique. At least that’s the prayer. May the lights and symbols of Chanukka seep into the deepest layers of our soul. May they reveal to us, the truth of us, and ignite us with the courage to live that truth. Demesek Eliezer on Zohar 2:53b (p. מא) devar hamatchil דנהרין. Midrash Rabbah – Exodus 36:2. R. Tsadok HaKohen, Pri Tsadik, Chanukka (throughout). The term, Oral Torah, can be confusing since it, too, is presently written (Mishna, Talmud, etc.). Anticipating this current Roman exile, R. Yehuda HaNassi (first century CE) invoked an emergency measure and permitted the writing of the Oral Torah. 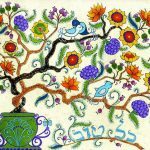 Sifra 105a; Maimonides, Mishna Torah, Introduction to Pirkei Avot 1, and commentaries. R. Tsadok HaKohen, Pri Tsadik (Fruit of the Righteous), Chankha 2 (p. 142); ibid Chodesh Adar, essay 1; Likutei Maamarim p. 80-82; Yisrael Kedoshim p. 152. TY Rosh Hashanah 3:8; Lam R., Petichta 2. The Temple’s menorah had seven branches. The Torah forbids us from forging a seven-branched menorah for personal use. Consequently (for this and other reasons) our Chanukkah menorah has eight lamps (plus, optionally, the shamesh).